Yesterday Jo and I braved the rather chilly wind that was sweeping across Plot #59 and set about planting the first batch of this year’s peas and broad beans. 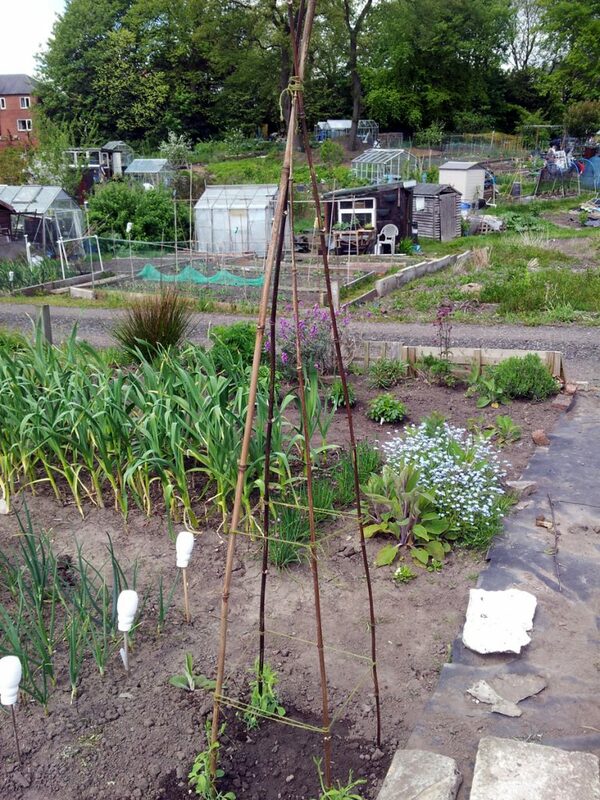 We started by setting up a pea harp: a bamboo cane A-frame with additional string supports (see last year’s post on the subject for more details, hat-tip again to Jane Merrick for the idea), ideal for scrambling climbers such as peas. I was in charge of the bamboo and Jo did a marvellous job of the stringing. 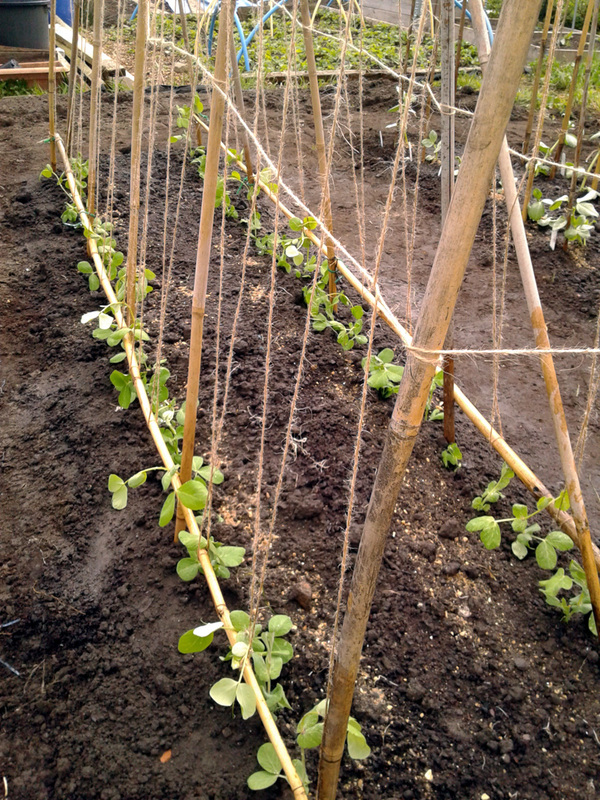 Plenty of string for the pea tendrils to cling on to as they get themselves established. 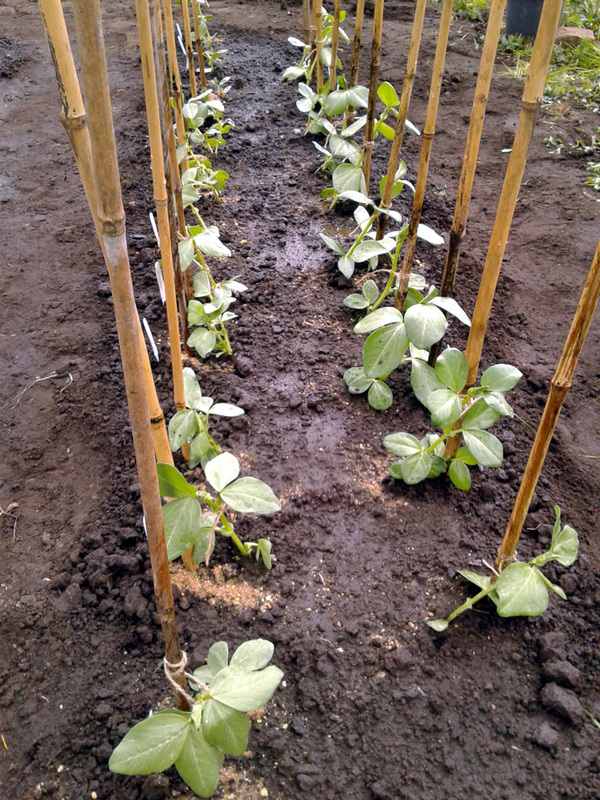 This double-row of broad beans should keep us well-stocked for months. These are a mix of three varieties: reliable ‘Aquadulce Claudia’, new-to-us ‘Mangetout Stereo’ and a few plants that I’ve grown from beans collected from last year’s crop, which may or may not turn out to be ‘Red Epicure’, or some variant on that theme. We have about 20 over-wintering ‘Aquadulce Claudia’ that are already in flower, so between those and this new batch we should be munching on fresh, tasty broad beans from May through to July, or thereabouts. Yum. With a few hundred seedlings coming along nicely in the greenhouse at home, we’ve been busy down at Plot #59, preparing ground and putting up a few of this year’s support structures for the crops to come. 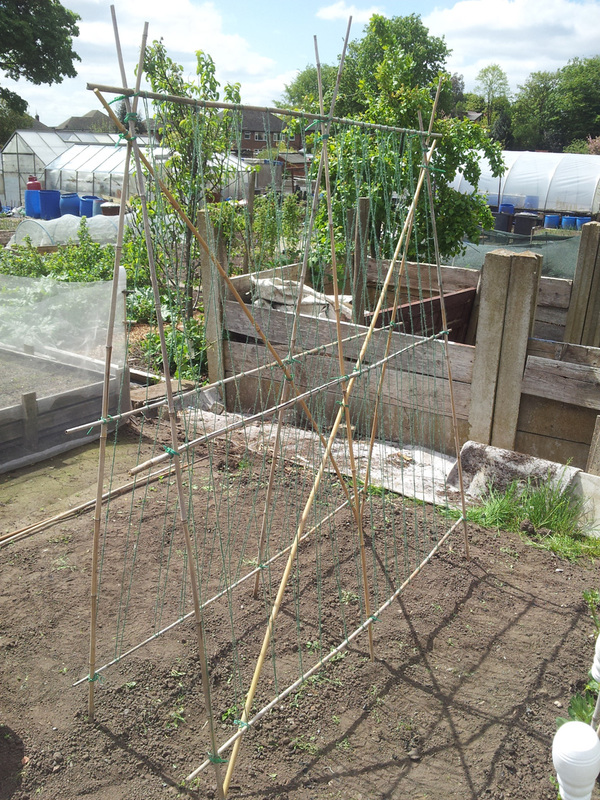 In the past I’ve grown peas up plastic netting, or just let them scramble through pea sticks. Earlier this year though, I read Jane Merrick’s blog post about her pea harp on heroutdoors.uk and decided to give it a go. The bare bones of the framework in place and ready for stringing. 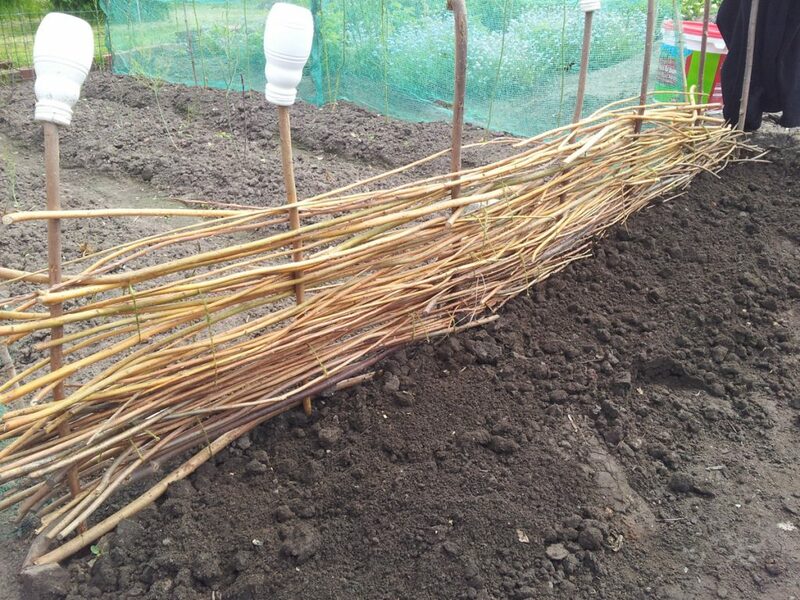 The finished pea harp, missing only a couple of slug traps… oh, and a few dozen pea plants. A lovely job, I’m sure you’ll agree. We’ll see how it performs later in the year. 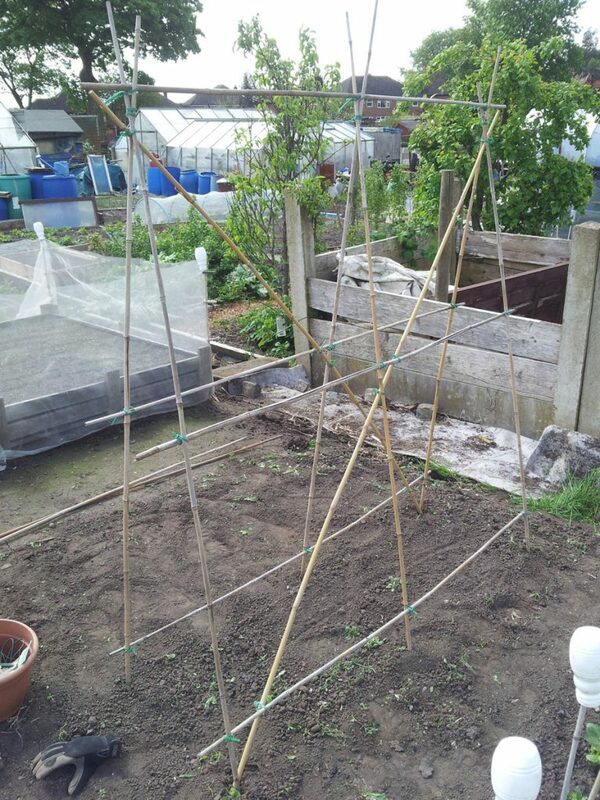 Over to the decorative department, and a couple of simple obelisk structures for Jo to grow her sweet peas on. All my own work, with four black bamboo canes and a couple of horizontal string sections for additional support and tendril-grips. Jo might add a few more strings later on, depending on how the plants seem to be managing. One of a matching pair framing the path onto the plot. Don’t look too closely, folks, it’s not a particularly pretty sight, but it’ll get the job done. 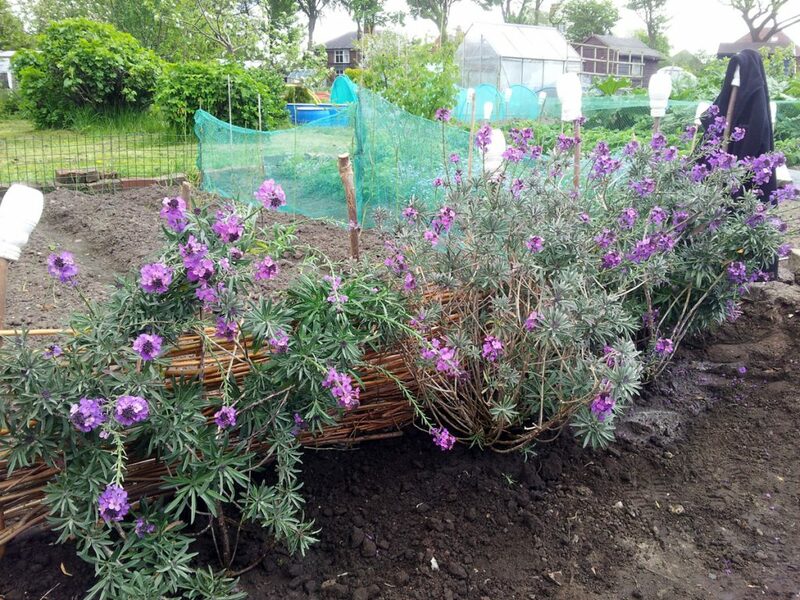 We then transplanted three mature Erysimum ‘Bowle’s Mauve’, which ought to help with the wind-breaking and should be enough to hide a multitude of weaving-related sins. More structural work to come in due course: plenty of A-frames for this year’s beans, more sweet pea structures, all sorts of good stuff.